A simple example inspired by Fuseki Exercise 6. Play out the right-hand corner first? This is a simple idea that is seen in pro play. comes before establishing the framework in front of Black's enclosure. The argument for playing , not simply extending to the big point , would be that , White a is perhaps reasonable for White. Once is played, White b becomes a possible invasion, but one which will cost White influence after Black c.
In fact if Black simply plays , White will quite likely just play tenuki. Another factor is that after the suggested moves the point d becomes focal. This will matter most in a large-scale game; but this side formation is not specially likely to occur in omoyo games. 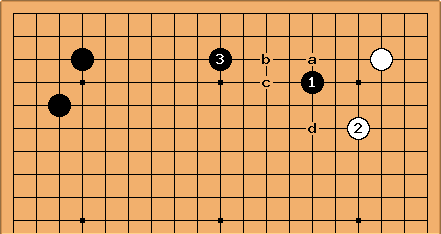 There seemed to be the implication in the discussion at Fuseki Exercise 6 / Discussion that Black might avoid 1 when the marked white stone as present, as if was a thank you move. Since Kato Masao has played this way, this is probably just a matter of style. Framework theory assumes initially that one does play out kikashi to build up frameworks; and more generally that in the sensitive border areas (see free and fixed boundaries) one looks to expand the framework. This is true if you assume that frameworks should be developed ambitiously, to their full scope. That is, however, not the whole story. There is a time for consolidating frameworks, rather than broadening them; and an elusive concept of 'right-sized' frameworks. There is also a need for positional judgement in building frameworks, which can overrule bad exchanges that might be used in the construction process.